This entry was posted in NO and tagged nyheter on June 8, 2012 by FEMEN. Spania vinner igjen, men vil Jimmy Jump entre banen? This entry was posted in NO and tagged nyheter on June 2, 2012 by FEMEN. This entry was posted in NO and tagged nyheter on May 24, 2012 by FEMEN. This entry was posted in NO and tagged nyheter on May 21, 2012 by FEMEN. This entry was posted in NO and tagged nyheter on April 11, 2012 by FEMEN. This entry was posted in NO and tagged nyheter on April 10, 2012 by FEMEN. 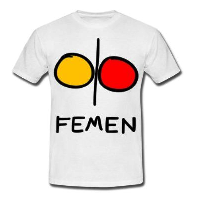 This entry was posted in NO and tagged nyheter on March 20, 2012 by FEMEN.